With its colonial architecture, the hotel welcomes guests to discover the charm of Hue. The hotel is located in the heart of the city, overlooking the Perfume River, and it is 3 minutes away from the train station. Just a 20-minute drive away is Phu Bai International Airport. Built in 1901 by the French, this air-conditioned establishment is one of the oldest hotels in Vietnam. 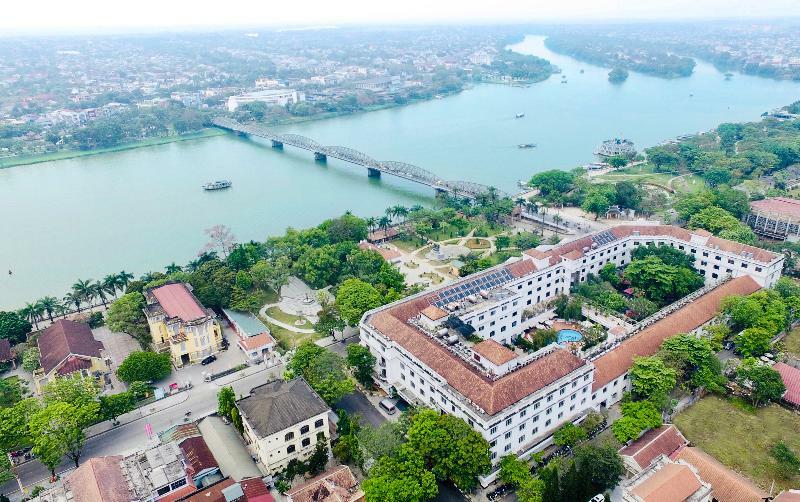 Having survived through many wars, it is more than just a hotel; it is a part of the history of Hue city over the last 100 years. With fully restored colonial architecture, the present hotel appears full of elegance and majesty in the eye of tourists, while offering the best in Vietnamese hospitality. With 184 spacious rooms including 18 suites, the hotel provides guests with excellent services and facilities. Looking back on a glorious history of more than 100 years, it is once again ready to live up to its reputation as the top choice for celebrities, intrepid adventurers and business people alike. Facilities include a lobby with 24-hour reception and check-out service, a hotel safe, currency exchange facilities, a cloakroom, lift access and a newspaper stand. The hotel additionally offers a hairdressing salon and a children's playground. For dining and drinks, guests can enjoy the on-site café, bar, pub and restaurant. Business guests can take advantage of the conference facilities, and WLAN Internet access is also available. Furthermore, room and laundry services, a car park and a bicycle hire are offered. You travel. WISE donates! Booking Saigon Morin at the best price includes a donation to your favorite charity, at no extra cost! We brought 18+ million euros to local communities providing social services to 150.000+ people from vulnerable groups. We support #GlobalGoals.